It was one of those kinds of weeks where everything is just going right in your life. New friends, new job, new opportunities–life is good. It always amazes me how getting rid of some negative energy, and surrounding yourself with positive energy and positive people can allow such great things to unfold in your experience. I won’t get into the details, but I will share one of those positive experiences, because it relates to detecting, and that, after all, is what this blog is about. I received a phone call from a friend Josh, who I recently met, and who lives on an old farm in Newtown, CT, which dates back to the 1700’s. Josh and I had previously spoken about my metal detecting hobby, he was very interested in it, and said he had always wanted to give it a try. After that conversation, he went out and bought himself a new E-trac (nothing like starting out with a good machine), and he wanted to know if I could possibly take some time to show him how to use it on his farm. Um… hello… an invitation to hunt a 1700’s virgin farm… Of course I was there in a minute. Well not actually a minute, maybe 45 minutes, but you get the idea. My new friend was obviously not aware how helpful (or obsessed) I am. Truth be told, I would have helped him even if he lived in the city and the only available dirt was at a local park, but the whole old farm thing just added incentive. Josh, it turns out, was a quick learner, and with a little instruction felt confident to head out on his own, so we began by the old barn area. After a while, he got his first find of the day, an oxen shoe–go figure. When I told him what it was, I could tell he was going to be hooked (Oh c’mon, you know your first oxen shoe was kinda cool at the time). I found a few Indians, flat buttons, an ox knob and a buckle, then Josh pulled out his first Indian and did a little dance. Success for him on his first day detecting–You gotta love it! Time was not on my side that day, I had to leave way before I wanted to, and before I found any of the coppers I just knew were there waiting for us. There is obviously a lot of great stuff to be found–we had only hit a very small area by the old barn. 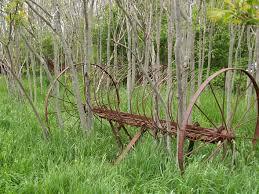 There are acres more to hunt, and the remnants of an old foundation, as well as the house, yard and farm fields. Josh was very thankful, and invited me back “anytime” to hunt his property. He was so enthused that he said he’s going to talk to some of his family who also have old property in the area to see if we could hunt as well. I will be taking him up on his offer, although from the way he took to metal detecting, I have a feeling that when I return, he will have fired his landscapers and the property will look like land mines exploded all over it. Seriously. All’s well that ends well, and it always makes me happy when a newbie has a positive experience detecting. I’m looking forward to hunting with him again, he said he’ll call with an update of his finds, and I’ve no doubt he’ll have some exciting stuff to show me. All I saw was “1700′s virgin farm” and I had to read more…. In all seriousness congratulations on a new job and a new outlook. That’s what happens when you read what Howland and I write. Yesiree they call us the “positive boys”….no negativity here!.. Ha ha…yes, you and John are very inspiring. Thanks for all the positivity. Most definitely, and I’m always happy to help someone who wants to try out this hobby.